In 2019 the Seminar of Slovene Language, Literature and Culture will once again travel back in time. We shall be taking a close look at 1919, a year that visibly marked Slovene culture and history. The seminar will focus on three main themes. The first is the establishment of the University of Ljubljana, and the history of Slavic and Slovene Studies. The university was officially founded on 1 September 1919; on 12 November the rector and deans were elected; and on 3 December the first lecture was given by Fran Ramovš. The first lecturers at the newly established university also included Rajko Nahtigal and Ivan Prijatelj. Since all of them had a marked influence on the early days of Slavic and Slovene Studies at the university, the seminar will focus particularly on the lectures given by these three professors. The second theme is the incorporation of Prekmurje. The year 1919 was an important milestone for Prekmurje, since for the first time in 900 years, during which the region came under the Hungarian monarchy, Prekmurje Slovenes were united with the motherland. On 6 August 1919 the army of the Kingdom of Serbs, Croats and Slovenes marched onto the territory of Prekmurje and fully occupied it the following day. The seminar will offer various views of the history of the region, e.g. the importance of Prekmurje Protestantism in the past and today, language policy, Prekmurje in Slovene literature, and so on. The third theme will be literature between the Two World Wars, with an emphasis on Constructivism and Expressionism, i.e. the literature that marked the period following the Moderna, which was shaped by generations that studied at Ljubljana University. In the first two thematic areas, as well as culture and history, there will be a great emphasis on the recognition of Slovene language standards, particularly in the light of diachronic development and contemporary findings in dialectology. For Slovene language, literature and culture, 1919 was in many ways a watershed. You are warmly invited to join us in discovering that year and helping to shape our understanding of it. The seminar is organised by the Centre for Slovene as a Second and Foreign Language at the Department of Slovene Studies, Faculty of Arts, University of Ljubljana, Kongresni trg 12, SI-1000 Ljubljana. The morning programme takes place entirely at the Faculty of Arts, the University of Ljubljana, Aškerčeva 2, Ljubljana, while the afternoon and evening programme is organised at different locations in Ljubljana. The seminar participants are foreign Slovene Studies and Slavic Studies specialists, writers, translators, experts in comparative linguistics and literature, and others who include Slovene in any other way in their life and work: teachers, researchers and students of Slovene and Slavic Studies at universities and research institutes abroad and in ethnic Slovene areas, etc. At the seminar they deepen and enrich their knowledge, learn about the latest findings and have genuine contact with the Slovene language, literature and culture. The lecturers, language teachers and other teaching staff at the seminar are established experts and professors from the Department of Slovene Studies, Centre for Slovene as a Second and Foreign language, the Department of Slavic Studies, other departments of the Faculty of Arts, other faculties of the University of Ljubljana, or other Slovene universities and leading research and national institutions and eminent experts and academics from abroad. The library of the Departments of Slovene/Slavic Studies keeps an open door for seminar participants. Throughout the duration of the seminar they can borrow books and turn for advice to the librarians. The library also prepares an exhibition every year, presenting recent professional literature, the best works of Slovene literature, and translations into foreign languages. The participants will visit the exhibition during their practical classes. Participants have (wireles) Internet access on all the computers at the Faculty of Arts and at the Ivan Cankar hostel, where they are staying. Accommodation is organised at the Ivan Cankar hostel, Poljanska cesta 26, building A. The hostel is situated in pleasant surroundings below Ljubljana Castle, 10 minutes’ walk from the city centre. It is a 20 minute walk from the hostel to the Faculty of Arts through the old part of the town. Accommodation is in three-bed, two-bed or single rooms, with bathrooms and kitchens (participants must provide their own dishes and cooking utensils) on every floor. All participants receive self-service breakfast, for other meals they have to make their own arrangements. The hostel also offers wireless internet access, an exercise room and social areas with televisions. Participants can leave their cars for free in the car park in front of the hostel. More information is available on the website www.dic.si. The date of arrival for participants at the Ivan Cankar hostel is Sunday 30 June 2019; the programme begins according to the timetable on Monday at 9 a.m., 1 July 2019 at the Faculty of Arts. The departure date is Sunday, 14 July 2019. The Seminar of Slovene Language, Literature and Culture is the central scholarly event through which the Republic of Slovenia promotes the study of and research into Slovene language, literature and culture throughout the world, by granting financial support on the basis of international contracts and co-operation programmes for ethnic Slovene organisations and researchers who are professionally engaged in Slovene, and for students at foreign universities who study Slovene. In allocating these scholarships, priority is given to Slovene specialists, university teachers, research and teaching assistants, postgraduate students and students of higher classes. accommodation in single room with breakfast: 420 EUR. Those receiving scholarships are requested to complete by 1 April 2019 the registration form on our website at the website (55th SSJLK, Registration Form) or to send it to us by regular post. You are also requested to send by 1 April 2019, along with the completed registration form, the completed language test, or to send it to ssjlk@ff.uni-lj.si or to damjan.huber@ff.uni-lj.si or by regular post. 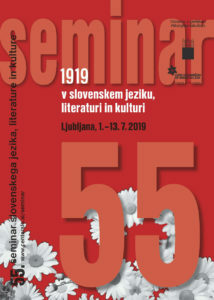 The registration form for participants of the 55th Seminar of Slovene Language, Literature and Culture paying the seminar fee and accommodation costs themselves should be sent by 1 June 2019. You can apply via the Internet at the website (55th SSJLK, Registration Form). The registration fee includes language classes, conversation classes, phonetics classes, lectures, elective courses, learning materials, the seminar proceedings, the accompanying programme, and event organisation. Participants paying for themselves can book accommodation at the Ivan Cankar hostel. After we have received your registration form, we will send you the invoice for payment of the fee by regular post or e-mail. You can pay the invoice for payment of the fee at any bank or post office. Please send your payment receipt no later than 25 June 2019. You can send it to our e-mail address or to our postal address. Please bring along a copy of the receipt when you join the seminar in order to help clarify possible misunderstandings. Upon receipt of your registration form we shall send you the language test, which will help us place you in the right group. Participants at the Seminar of Slovene Language, Literature and Culture receive a certificate of attendance if they take regular part in the obligatory section of the programme. The seminar will be credited under the European Credit Transfer System (ECTS). Students who regularly attend language, conversation and phonetics classes, as well as lectures and elective courses, and who pass the exam at the end of the seminar, will receive 3 credit points (3 ECTS). All seminar participants are recommended to obtain a certificate of medical insurance in their home countries, otherwise they must pay the expenses of medical care and medication themselves. As they will not be entering Slovenia as tourists but for purposes of study or professional training, they are advised to arrange before they come a temporary residence permit for Slovenia. This is particularly important for citizens of third countries (not the European Union, Norway, Iceland or Liechtenstein), who are required to obtain this document even for short visits, while citizens of member states of the European Economic Area must obtain it within 90 days of entering Slovenia, however, they must register with the police immediately after their arrival. The main seminar programme includes practical language classes (2–3* school hours per day), conversation classes (1–2* school hours per day) and phonetics classes (4 school hours for intermediate and advanced groups, or 6 school hours for each beginners group), as well as lectures and special courses. Participation in this part of the programme is compulsory and is required in order to obtain the certificate of attendance. There is also a rich, optional afternoon/evening programme of different events. *The balance between the number of hours for practical classes and conversation is agreed by the lecturers. Practical classes will probably be organised in 3 beginners, 4 intermediate and 3 advanced groups. According to their interests, participants of the advanced groups can choose among linguistic, literary and general groups. Individual participants are assigned to an appropriate group on the basis of a language test completed before arrival at the seminar, and oral testing carried out at the beginning of the seminar. Practical classes are compulsory for all participants. These classes are aimed at improving communication skills, extending vocabulary, internalising communication patterns and eliminating errors. They will deal with themes taken from everyday life, with an emphasis on practical communication and on extending acquaintance with Slovenia and its culture. In the afternoons, beginners and intermediates groups will have 12–18 additional hours of conversation with Ljubljana students of Slovene Studies; these conversation classes are compulsory. Phonetics classes are compulsory and organized on two different levels: (a) classes for beginners that start with an introduction to the Slovene spoken language and specifics of its phonetics, with examples from texts. This is followed by practical exercises to improve pronunciation and listening skills necessary for more efficient learning and use of the language. The exercises are adjusted to the participants’ level of knowledge and to their mother tongue; (b) exercises for intermediate and advanced level, intended to improve speaking skills and understanding of spoken texts. Lectures (13 school hours) will offer the latest thoughts on and achievements in Slovene linguistics, literature and culture. They are compulsory for participants in higher intermediate and advanced groups, but others can also attend since they are public. 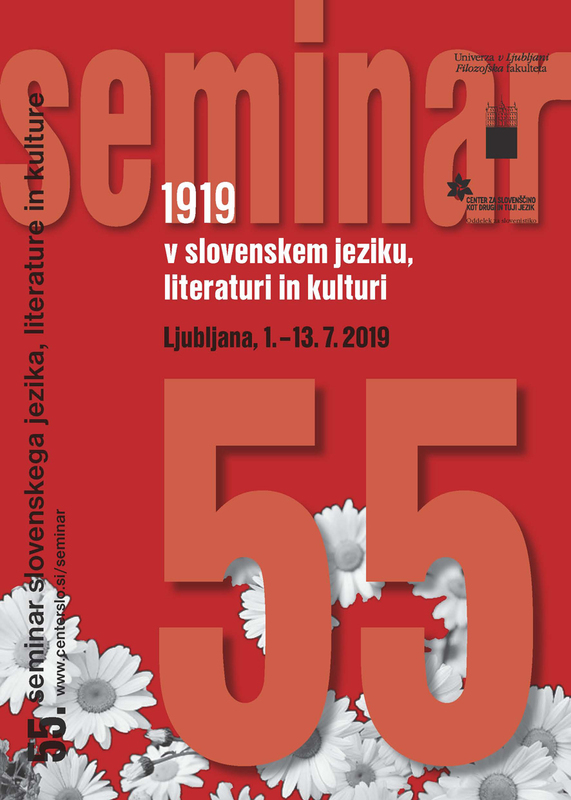 The 55th Seminar of Slovene Language, Literature and Culture will focus on 1919 in Slovene Language, Literature and Culture. As always, the lectures will appear in the seminar proceedings and on the website. Similarly, the lectures will also appear on the portal Videolectures. Elective courses of 4 school hours each take an in-depth look at current issues relating to the Slovene (standard) language and literature, translation, Slovene culture and Slovene as a second and foreign language. Classes take the form of workshops. The lecturers’ contributions are published in the seminar proceedings. Selection of and participation in an elective course is compulsory for all those in intermediate and advanced groups. Within the framework of the 55th Seminar of Slovene Language, Literature and Culture, there will take place a two day international conference entitled Slovene at Foreign Universities – on the Centenary of the University of Ljubljana, at which will participate teachers of and researchers into Slovene at universities and institutes around the world, many of them former participants in the seminar. Conference papers will be published in proceedings and on the website. All seminar participants are warmly invited to attend the conference. The seminar also offers a rich afternoon-evening programme, which includes themed guided tours of Ljubljana, the showing of a Slovene film, a theatre performance, visits to museums, galleries and libraries, musical and literary evenings, etc. This additional programme includes a whole-day study excursion, which will take place this year on Saturday, 7 July 2018.